It's Summer! Yes! I've been really getting back into my illustration work for pleasure after tying up the last loose ends from 'The Lavender Blue Dress' book project (which was a long and brilliant commission!). Spending Summer by the sea has definitely been inspiring, and having a week off can really help reset the ol' creativity. 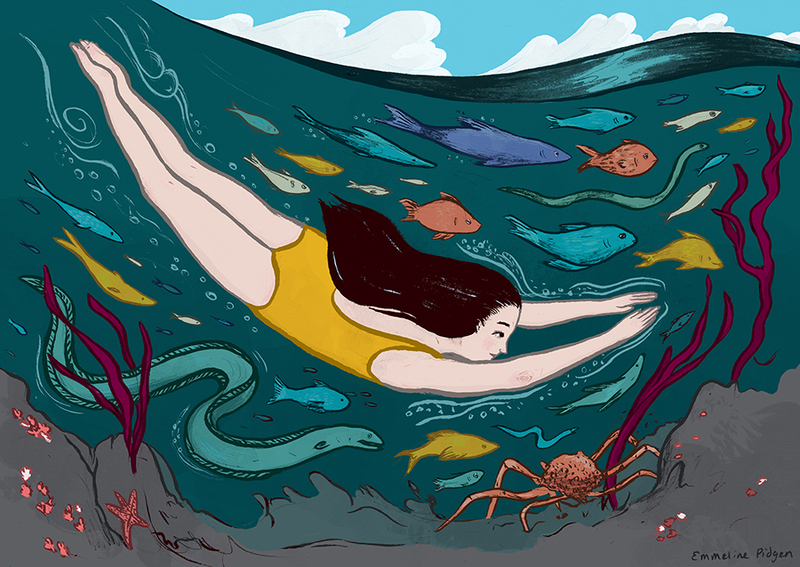 I wanted to have fun creating a simple illustration, and to really focus on movement - and with the hot, humid weather we've been having lately an illustration of a cooling dive into the ocean seemed perfect. I started with a loose pencil sketch (very, very loose!) and jumped straight into working with ink brush pen and traditional ink and paintbrush to create the fluid looking linework. I then scanned the artwork at a high resolution and worked up the colouring on Photoshop with custom brushes and watercolour textures. It's one of my favourite ways to work quickly as there's so much potential to switch colours around and make easy adjustments. I'm considering making a small print run of these available (and potentially have the original artwork up for grabs in my shop), so give me a shout if you'd be interested!